Looking for a solution to install WordPress locally? Below, I’ll go through all the popular methods that you can use to install WordPress locally on your computer. Again, I’m not going to provide specific instructions for each method. But I will link you to some tutorials where necessary. XAMPP is the first in a series of weird acronyms that you’ll see. 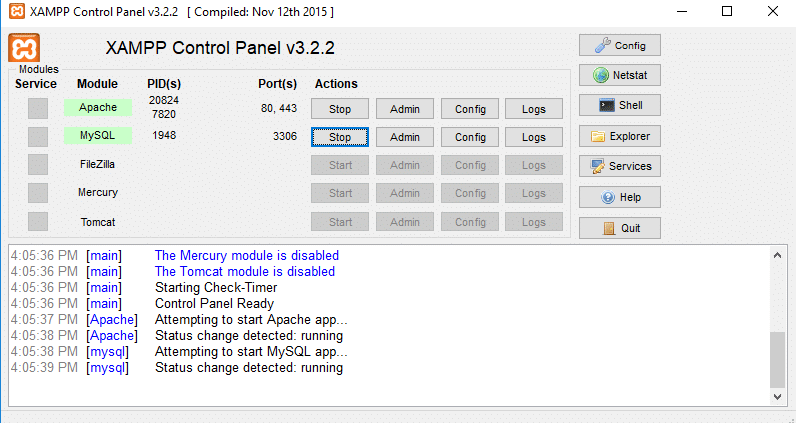 Essentially, XAMPP installs a stack of the Apache web server (A), MariaDB (M), PHP (P), and Perl (P). That, combined with the fact that it’s cross-platform (X), is where XAMPP comes from. Once you install XAMPP on your computer, you’ve basically got a web server running on your own computer. From there, you can install WordPress using the famous 5-minute install and use it right away. XAMPP is what I personally use to test most plugins and themes nowadays. And once you get the hang of how it works, it’s fairly painless to spin up new WordPress installs (though there are a couple tools on this list that make the process even more streamlined). If you’re interested in using XAMPP, check out Joe’s tutorial for how to install WordPress locally with XAMPP. WAMP is a Windows-specific stack of Apache, OpenSSL, and MySQL database (the W is for Windows). It has a lot of similarities to XAMPP, it’s just not cross-platform, which means that you can only use it with Windows. And finally, MAMP, as you’d expect from the “M”, is a similar approach that you can use to install WordPress locally on Mac. 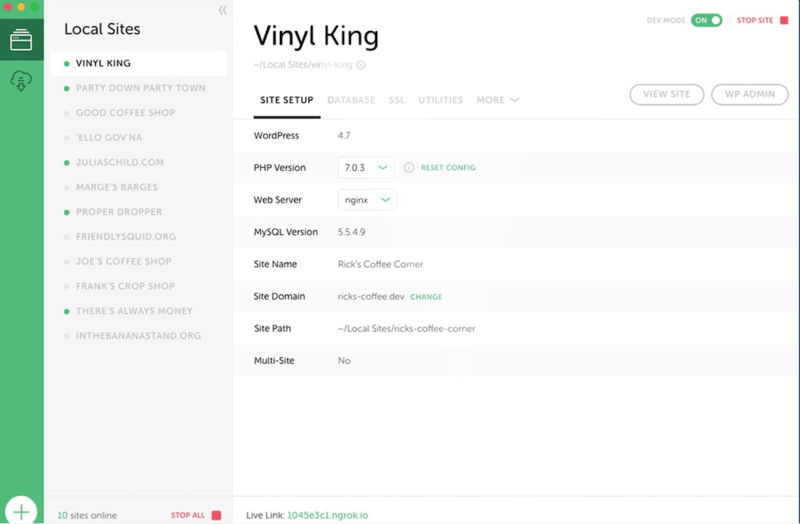 Local by Flywheel is a productivity-boosting WordPress development tool from Flywheel hosting (you do NOT need to be a Flywheel hosting customer to use the plugin – but Flywheel customers do get some cool extra features that are specific to the platform). I previously used Local by Flywheel, though I eventually ended up switching back to XAMPP because XAMPP ran a little faster on my computer. Despite my personal decision, Local has a number of advantages over XAMPP because of how much control it gives you over your development environment. It also makes it incredibly simple to spin up a new site, and you can clone sites with just a few clicks. Finally, it has the awesome Blueprint feature. Essentially, a Blueprint is a pre-defined configuration of settings that you can apply to new sites to save time. And if you are a Flywheel hosting customer, you get the ability to deploy your local development site to a Flywheel server with a single click, which is pretty dang convenient. If you use another host, you’ll have to move your site manually. DesktopServer is another WordPress-specific local development tool that makes it dead-simple to install WordPress locally. Like Local, it lets you quickly spin up a new WordPress install in just a few seconds, without the need to manually run a WordPress install like you have to with XAMPP and Co. It comes in both a free and premium version. The free version lets you install up to three local sites at a time with the simple installation wizard. But the premium version is where many of the most productivity-boosting features are. I’ve played around with the free version of DesktopServer and found that it delivered on its promises of ease-of-use and speed. And I’ve seen a ton of WordPress developers who swear by the premium version. If you’re interested in using DesktopServer for local development, click below to download the free or premium version. This one isn’t for casual users, but Docker is a great option to install WordPress locally for more advanced users. You already saw Docker mentioned with Local. But if you’re not familiar, Docker is a tool that helps you create isolated “containers”. People use these containers for all sorts of things, but one of the things that you can do is install WordPress in a container. By using Docker Compose, you can easily spin up a new WordPress install in an isolated container. All you need to do is follow this guide. This isn’t a method that I’ve personally used, but if you’re running on Ubuntu, you can install WordPress locally by creating your own LAMP stack on Ubuntu. If you’re interested in this method, we have a detailed tutorial on how to install WordPress locally on Ubuntu Linux. Which Method Should You Use To Install WordPress Locally? For WordPress users, the two most streamlined local development solutions are Local by Flywheel or DesktopServer. While the other methods are all generic tools to help you run a web server on your localhost, these two are actually built specifically for local WordPress development. If either of those are negatives for you, XAMPP is the next best tool that I’ve found – it’s just not quite as streamlined to create new sites. I haven’t personally used any of the other methods, so I can’t speak to them beyond saying that I’ve seen plenty of developers praise them as quality solutions, so I’m sure there’s a reason they keep popping up. Have a question? Or know any good tips to install WordPress locally? Let us know in the comments! How funny…. I am in the midst of working on 3 different sites with about 20 tabs open. I’m sure you know the story. Anyway, I stopped to take the dogs out and pulled up Google Now to read the news and this was the top article. Appreciate it! I’m going to try one now! I’ve been a DesktopServer user for a long time. But the updates were so sparse that I stopped renewing my premium subscription. A new major version with PHP7 compatibility was announced way ahead of being available. I then tried Local by Flywheel and just started to use it in new projects. I’ll probably won’t be going back. I am surprised you didn’t include AMPPS in your list – http://www.ampps.com/. It beats the other options hands down as it is quite simply a desktop version softaculous found in most CPanel installations.